I thank God for giving me great blessing to study at Yale University for 5 months from January to May 2014 in a “sandwich program” of ICRS. It is a privilege for me to be at Yale University, one of the best universities in the world. Yale was founded in 1701 as the third oldest institution of higher education in the United States of America. Yale’s alumni have spread all over the world; many of them are great leaders and have significantly contributed in making a better and peaceful world. I had a dream to study in the States, and this dream came true though it was only for one semester, because of this sandwich program. Moreover, I could have it at Yale! This program has made me possible to enjoy the best education in the academia (and too many good things) that has given me a lot of inspirations as it has been given to many great leaders all around the world. Out of those so many good things about Yale, due to limited space I would like to share three things. Can world faiths learn to respect other faiths and humanistic ways of life even while disagreeing with them? Can world faiths embrace freedom of religion and areligion and thus become “democracy friendly”? Can democracies be “faith friendly”—set up such that they are equally friendly to all religious and areligious ways of life? Secondly, I believe that the privilege to learn from a great professor at Yale will not be enough without enjoying the system and facilities in this best university. The libraries, museums, transportation system, student activities/groups, forums, seminars, conferences, and communities have made anyone in this university will be very rich in knowledge, network, and also social life. It is impossible to participate and to enjoy all of them, though all of them are very interesting. I joined the Asian Network at Yale to build a network with Asian scholars and students as well as those who focus their research on Asia. The largest number of international students and scholars at Yale is from China. Indonesian students and scholars are only not more than 10. 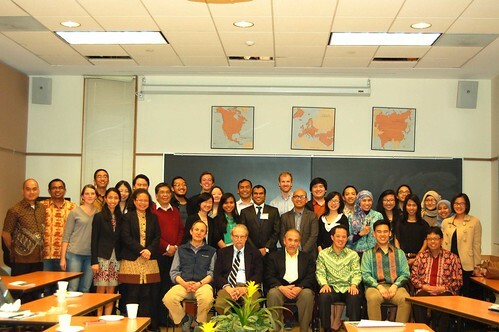 Nevertheless, every year Yale supports the Indonesian students to organize Yale Indonesia Forum (YIF). I was involved as part of the committee to organize the 11th Forum 11-12 April 2014. Other interesting event that I joined was International Conference on Philo. This international Conference gathered almost all world scholars on Philo. But interestingly, they open the floor for some Yale Ph.D. students to present their research/paper as well. It is encouraging for the students that can speak and discuss in one platform with world scholars. Lastly, as my interest in interfaith relation, I tried to join some interfaith activities at Yale. Though Yale originally was a Christian institution, but now it recognizes and serves all students of their religious backgrounds (including those that considered as small sects) by the chaplain office. It means, in the midst of secularism in the West, Yale still sees student religious life as one of important aspects that the university should care. Yale gives the facilities for all religious groups to have their activities on campus. Annually the chaplain office organizes an interfaith week (SOUL week), which every religious group opens their worship or religious activities to all students from other religious groups. On that week, I attended the Jumah Prayer of Muslim group in the afternoon and then joined the Jewish Sabbath in the evening. It is interesting to see some Jews and Buddhist also attended the Jumah prayer, as well as some Muslims joined the Jewish Sabbath. On Sunday, I attended the Mormon Church, which generally considered as heretics sect by the Christian church. Besides this annual program, there are Muslim-Jews study group and Christian-Jews scripture study group which meet regularly. How lovely this religious respect and harmony, which I have not seen and experienced in Indonesia before. I wish this kind of religious life can be seen in the state Universities in Indonesia like in UGM. I understood that ICRS sandwich program that I have is supported by the generosity of Henry Luce Foundation. Before I went to Yale, I had very little knowledge about Henry Luce. One day I was invited by an Indonesian lecturer at Yale to meet at his office. And I was surprise because his office is part of South East Asian studies which is at the 3rd floor of Henry Luce Hall. I just realized that Henry Luce was one of Yale graduate, one evidence how Yale has made great impact to the world through the alumni. By Henry Luce Foundation, at least ICRS Indonesian Students can enjoy this privilege. And I hope what I have enjoyed can be enjoyed by more students that will make bigger impact both in Indonesia and the world as what John Kerry (US Secretary of State, Yale 1966) said in 2014 Yale Graduation.